One game over, another about to begin. 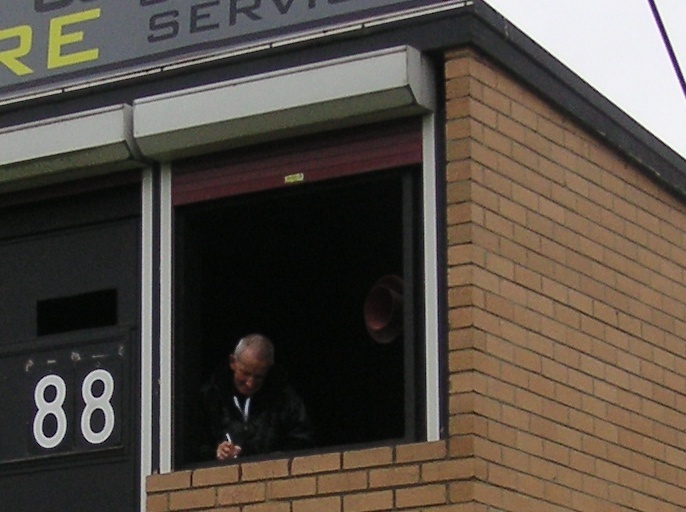 The scoreboard attendant, timekeepers and umpires are safe and secure in the cream brick scoreboard at Shelley Reserve, a fair dinkum suburban footy ground in Melbourne’s north. Paling fences and gum trees border the Shelley St ground. Cars park around the boundary. And the siren is a dinky-di air-raid siren. 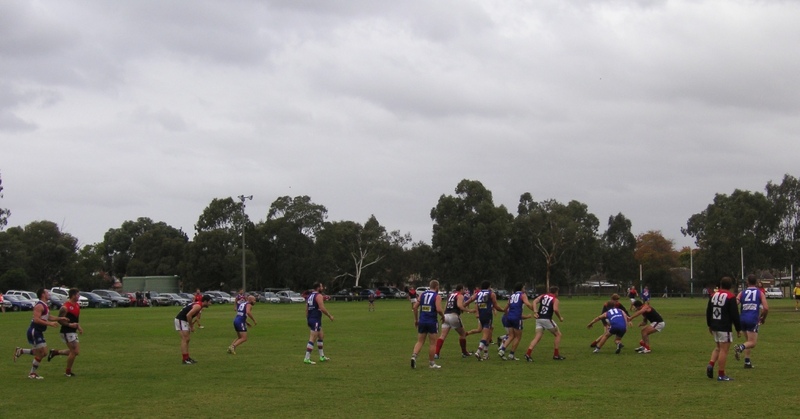 North Heidelberg, the Bulldogs, play in the second division of the Northern Football League. I stumbled across your scoreboard website and noticed your pictorial article about the North Heidelberg football scoreboard. 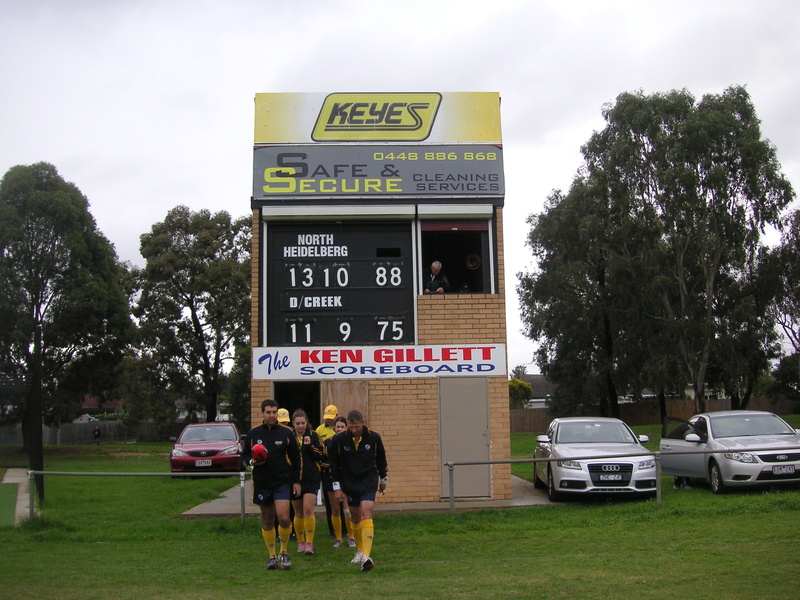 There are a number of similar ‘brick s–thouse’ scoreboards in the same local comp (Northern Football League) including at Bundoora and Watsonia, which are throwbacks to the 70s I think. However, there are fewer of these old scoreboards left as they are all being electrified. The one at Watsonia was electrified a couple of years ago although the original building was retained and named after the bloke who’s run the scoreboard down there for the last 20 years. I think the fellow’s name is Doug. My reckoning as to why they electrified the scoreboard was that Doug wanted to be able to operate the scoreboard with one hand and with a bourbon & coke in the other hand and it was a bit difficult to do so, particularly because of some of the frightful beltings that Watsonia had been copping in recent years. I used to umpire there as a boundary many a time in the seniors. At the end of the day, Doug often used to have a garbage bag full of empty Woodstock bourbon cans. He was fantastic to us boundary umpires though, by blowing the last quarters off after 15 minutes or so, if the game’s conclusion was foregone.